January 24, 2013, Toms River, NJ – Today marked a very special day on campus for the American Institute family as well as the Toms River community. 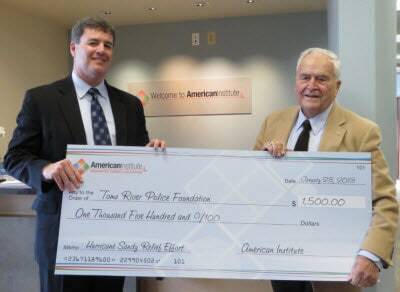 American Institute was able to present a donation of $1500 to Mayor Thomas F. Kelaher in support of the Toms River Police Foundation for Hurricane Sandy Recovery at the campus’ Grand Opening event. These funds were raised by American Institute’s campus in Margate, FL. As part of the American Institute family of schools, and familiar with hurricanes as FL residents, the staff and students of the Margate campus responded immediately to assist the students and those affected by the hurricane in New Jersey. From December 1st through December 19th the American Institute Salon & Spa donated 10% of all services to their “Hurricane Sandy Relief Fund”. In addition to the fundraising efforts through their Salon & Spa services, they also held a separate Holiday Fundraiser on December 15th including a Massage-A-thon and Campus Garage Sale. “I’m proud of our Margate students and staff and the commitment we all share to supporting the communities where we work and live. American Institute really values and cares about the communities we operate within,” said Christopher Coutts, President / COO, American Institute synthroid tablets. Mayor Thomas Kelaher said, “On behalf of the residents of Toms River, I’m truly grateful for the support and generosity from the Florida American Institute campus. It’s humbling when strangers from another state pitch in and raise funds for the benefit of our homeowners. This $1,500 will go to the Toms River Police Fund to be used for helping our residents with the services they desperately need after Hurricane Sandy.” Kelaher toured the new American Institute campus, which focuses on Innovative Career Education. “This is a unique facility and quite state-of-the-art. We have many residents looking for a career change and this institute can very well put people on a new career path.” American Institute is proud to join the Toms River community and to offer career training in Medical Assisting, Dental Assisting and Computers, Networking and Security. Visit our campus today at 2363 Lakewood Road in the Walgreens Plaza in Toms River, NJ.